The interest from an adjustable mortgage rate can vary. On the flip side, a fixed rate mortgage stays the same. ARMs usually begin with a low-interest rate while fixed mortgage rates don’t. In addition to, when the introductory period of an ARM end after a certain period of time, the amount of interest you pay and monthly payment increases too. The index is a broader interest rate measurement that the rate you pay binds to. As the index increases so do your payment. When the interest rate decrease, the amount you pay still increases unless there’s a cap on the interest rate. An adjustable-rate mortgage calculator is useful to see the effect of interest changes on your mortgage payment, depend on the type of mortgage you chose. This type of ARM comes with an initial fixed rate cycle. Moreover, the interest rate adjusts on a yearly basis. A cycle in regards to a fixed rate can range anywhere from three to ten years or more. For example, a Hybrid ARM that’s 3/1 has a fixed rate of three years and moves year to year. On another note, it’s easy to see that there are many types of ARMs to choose from. Moreover, you might see some of these while shopping. For instance, at an 8/1 ARM, your fixed rate is 8 years and then adjusts every year. On the other hand, with a 9/2 ARM, your fixed rate is 9 years and then adjusts every 2 years. With a 3-year term, you fixed rate is secured for three years and then adjust yearly. In a nutshell, this means that you solely pay the interest on a mortgage. You have to agree to pay the interest for a period of time and not the principal. As a result, this gives you smaller payments for that period. The period normally ranges from 5 to 10 years. For example, you only pay the interest for seven years with a 7/2 ARM with adjustment made every two years. The loan outlays after the period expires. In addition to, it’s paid off by the length of the term. Also, keep in mind that this has the capability to progress to higher monthly payments. This type of ARM allows you to have various payment options such as interest only, a minimum payment, or a 15/30/40-year fully amortizing payment. An index is a process that takes place when an ARM shifts to another interest rate once the fixed rate period stops. A neutral group establishes and index. Moreover, it relies on the market forces. Typically, loan documents define what index follows an ARM. In addition to, there is a lot that goes into this. The first step is to understand the rate. The lender takes the index rate and adds the margin (percentage points) to determine the ARM rate. While there are many factors that determine your rate, your credit score is the highest determining factor. Moreover, if you don’t know your credit score, there many ways to obtain it for free. For instance, you have a 1.75% index with a margin of 2 percentage points. When you add these two together, you get a total of 3.75%. If the index decides to shift to 2% later on, the interest rate will increase to 4%. Let me repeat: Margins DON’T change. Only the index can change. Here’s another example: You have an index of 7%, and the margin is 3%. This adds together to a 10% interest rate. The new interest rate is 7% if your index decreases to 4%. Research the pros and cons of adjustable-rate mortgages to find out if this is the right option for you. Next, find a reputable mortgage lender to begin the development phase of buying your new home. What Are The Advantages Of an ARM? First off, ARMs have appealing introductory interest rates. This option is really appealing to people who want to have low, monthly payments and save during the introductory period. Moreover, for people who want to take advantage of selling their home in the short term before the rates adjust, this is a really great option because of low-interest rates. This option is also in favor for those who know their income will increase before the initial period ends, so they can save money in the beginning. Also, even though there is the possibility of changes happening in the index that transitions to a lower interest rate, any individual who is looking to purchase an ARM should expect to see there interest rates and monthly payments increase. Furthermore, adjustable mortgage rates have an interest rate cap. Overall, if an individual feels as though they can make the payments at the highest interest rate allowed by the loan, payment increases shouldn’t be a hindrance from you pursuing the loan. What Are The Disadvantages Of an ARM? The risk of having an adjustable rate mortgage is that the interest rate can increase dramatically. As a result, the payments on your mortgage increases along with it. Just in case your interest rate rises, it’s good to have enough finances to meet your new payment expectations. Also, if you have problems with budgeting, you may need to reevaluate whether or not an ARM is good for you. Because there are more variables at play, ARMs are more complex than fixed rate mortgages. In addition to, their are some ARMs implement pre-payment penalties. It’s very important to understand all of the cons of an ARM because it can be bad for you if you decide to sell or refinance. Your personal circumstances play a huge role whether or not you need an ARM. Furthermore, to qualify for any home loan, having good credit, a stable job, and a good debt-to-income ratio are all considerations that determine whether you’re eligible for the loan. In addition to, if you are considering purchasing a new home, the sear the things you need to consider. You can always consult your lender about the loan pre-qualification process if you have any questions. 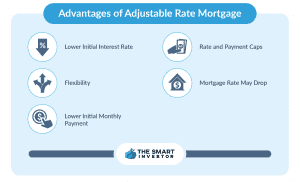 Adjustable Rate Mortgage is Best For.. If you plan on not living in your house for a long period of time, then an ARM is a better option for you. Moreover, it doesn’t make sense to a have a fixed rate mortgage of 30 years if you have plans to move out in seven years. If you still not sure – you can always compare them through our adjustable Vs fixed mortgage calculator. Another good candidate for an ARM is an individual who wants to borrow an amount that’s higher than their area’s loan limit. The pricing of a fixed rate loan tends to diminish with big loans. The main difference between a fixed rate loan that’s within the loan limits and one that’s not can be as high as 1.50 percent. Large ARM rates frequently beat a fixed rate mortgage rates by 2.5 percent or higher. Furthermore, if you like knowing the exact, monthly payment, a fixed rate mortgage is a better option for you. For instance, if interest rates increase in the future, yours won’t increase because you’re rate never increases with a fixed rate mortgage. Also, fixed-rate mortgages are great for those who desire to stay in their home for a long period of time.